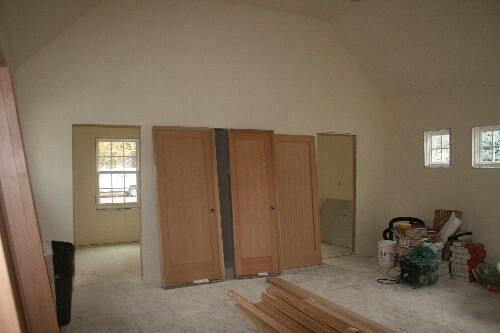 The master suite addition is now drywalled and painted. The walls and ceilings through the suite are painted a cream color. 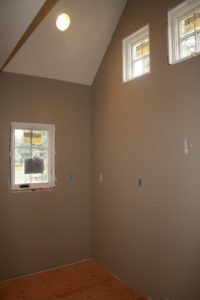 When trim goes in around the base of the room and the windows, the cream on the walls will set off the crisp white of the trim quite nicely. We’ll be sure to post photos and descriptions of the detailed trim work going into the project. In the following two weeks new hardwood flooring will be installed in the entry and closet of the master suite, and tile work will be completed in the bathroom. We can’t wait to see the bathroom tile installed! The newly painted kitchen addition. In the kitchen, drywall has been completed, and painting has happened here too. In here the homeowner chose to abandon the cream walls in the rest of the house for a punch of color. The darker walls will look great against the white cabinets. In the last week the cabinetmaker has taken his final measurements of the space, and will start constructing the kitchen cabinets sometime this week. 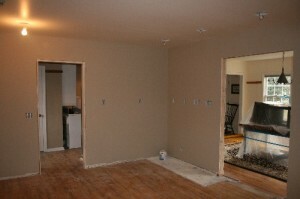 The kitchen will have all new cabinetry, with a focus on function and storage. In the coming weeks, we’ll devote an entire post to cabinetry. 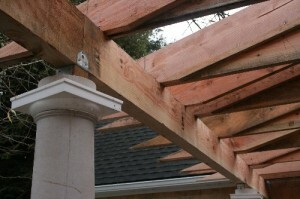 Porch roof rafters and columns. 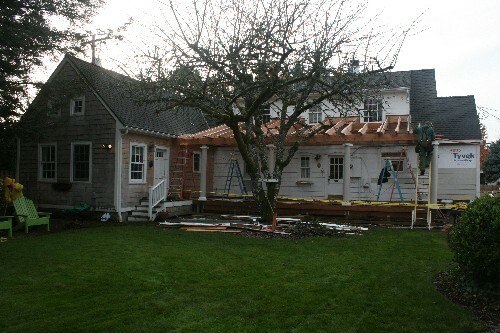 Outside the porch is really taking shape. Last week saw the installation of the decorative columns and roof rafters. The photo below shows the intricate framing at the upstairs windows. 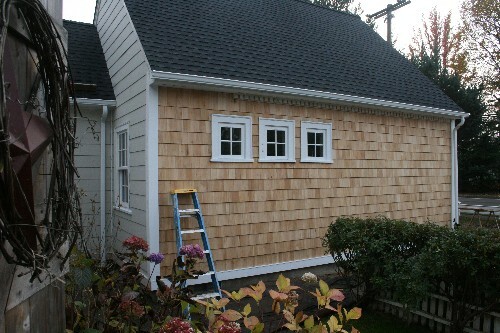 Because of the slope of the porch roof (matching an adjacent covered porch on the garage), and the location of the upstairs window, window wells had to be designed. These “wells” are framed as flat roofs in front of each window. From the backyard the change in roof pitch will be hardly noticeable, and this framing allows for us to leave full size windows in the upstairs bedrooms, while still having an attractive roof over the porch. Window well framing at the upstairs bedroom windows.